Click on Advanced user->Virtual Server on the left side menu, and then click on Add button. Type in the port number (External port/Internal port) which you want to open and the IP address of your device which you want to open port for; Select the Protocol to TCP, UDP or ALL. Note: You´d better assign a static IP address for your server, so the Virtual Server entry will take effect all the time. Or you can just do an IP address reservation for the server. 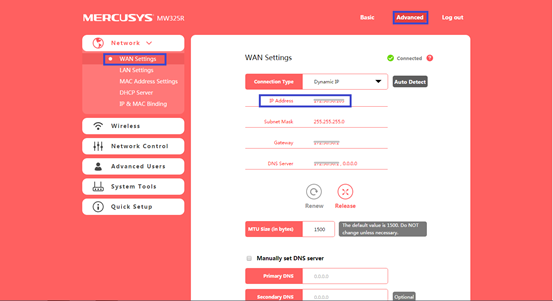 Go to Advanced->Network->WAN Settings page and check the WAN IP Address of the router. 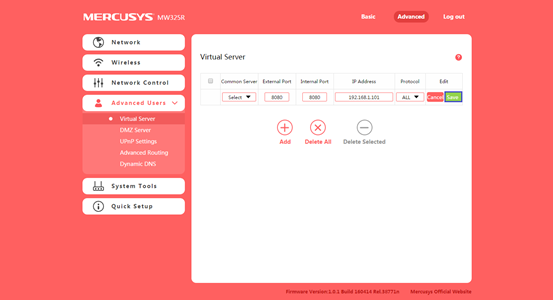 Now you can try use the WAN IP: Port Number to access the service from outside network. If the WAN IP Address of the router is not a public IP Address, but a Private IP Address, that means there is another NAT device connected to the WAN Port of the MERCUSYS router, you need open the service ports on that device as well. A) The router’s management port number is 8888. The Remote Management is disabled on default settings. If the Remote Management is enabled and you want to open port 8888 for a local device, please change the router’s management port number first. Go to Advanced->System Tools->Web Management, and change Port to other ports such as 8000 and click on Save. B) This model supports different External Port and Internal port. Here we will explain this configuration under different situation. If you have two or more devices (192.168.1.102 &192.168.1.103 in this example) want the same port to be opened for a certain service, then you will have to use different External Ports. For the Internal Port, please put in the actual port number (90 in this example), then create different Service port numbers for the two devices (8000 and 8001 in this example). After the configuration, you can access the two devices using different External ports. In this case, you can use WAN IP:8000 to access 192.168.1.102 and WAN IP:8001 to access 192.168.1.103.